HAVANA, Mar 26 2013 (IPS) - Thousands of young Cubans are graduating in computer engineering, a sector the government decided to strengthen over the past decade. But their professional future is uncertain because of failures of organisation and of internet connectivity. “I haven’t been able to work as a computer engineer,” a 24-year-old woman who graduated in 2011 told IPS. She attended the University of Information Science (UCI), a centre for development and training that was planned as Cuba’s great stride forward in 2002 to boost the field of software programming. While she was studying, the young woman imagined she would have a secure future in the field of computing. But instead she has been posted for training in a state institute of statistical analysis, where the work is suitable “neither for a computer engineer nor an information technologist. “I am not learning anything in my specialty, and at the office I just work on statistics,” the engineer, who requested anonymity, complained. Only a few of her fellow students got jobs in software development, while many others are teaching in secondary schools or institutes. A total of 1,600 computer engineers graduated in her year. Juan Triana, at the state Centre for Studies on the Cuban Economy, said this Caribbean island nation needs to make better use of the human capital educated over decades at its universities. The country has the potential to make progress in the knowledge economy, but it must be more innovative in science and technology, and organise regional and local innovation systems that make use of its human resources, Triana says in his 2012 article “Cuba: la economía del conocimiento y el desarrollo” (Cuba: the knowledge economy and development). That way, he says, computer engineers and technicians from the Havana-based UCI could play an important role in the economic reforms set into motion by the government of President Raúl Castro in 2008. Up to July 2012, 10,021 computer engineers had graduated from UCI in Havana, not counting graduates from the university’s campuses in three other cities. Other universities also teach information science, but have fewer students. Technical education also includes this specialisation. The National Office of Statistics and Information reported that in 2011, 1,466 students graduated in electronics, robotics and communications. But there are more computer professionals than jobs generated by the industry, according to observers. 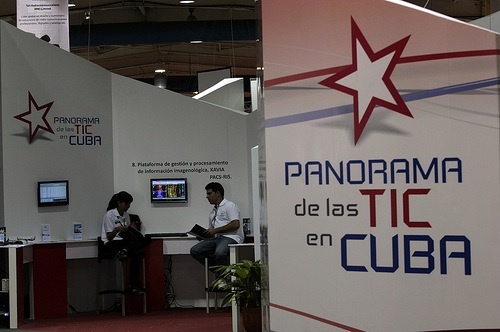 However, Luis Guillermo Fernández, the head of Softel, a company creating computing solutions for healthcare, disagreed with this analysis in conversation with IPS at the international Informática 2013 Fair, held in Havana Mar. 19-22. The fair has been held for the past 15 years for the exchange of ideas and knowledge with companies and researchers from other countries, and to boost business deals and cooperation. This year it was attended by some 1,400 experts from 30 countries, with China in the lead. Among the problems, Fernández mentioned the need to set clear development goals and priorities, attract investment, bolster competitiveness, quality and efficiency in order to increase service exports and attract foreign companies to manufacture some components in Cuba. The country only has a bandwidth of 323 megabits per second via satellite, which limits connectivity to internet by institutions, companies, and even more so by households. Since 2012 a fibre optic cable has been operational thanks to an agreement with Venezuela, which, it is hoped, will gradually improve matters. Exporting goods and services was one of the aims in 2003 when the sector was expanded. Although centres like UCI sell some of their products and computer engineers are working on projects with countries like Venezuela, experts say there is still a long way to go. Import substitution and export promotion were other goals, but not enough progress has been made, participants in the fair said. At the end of 2003, the country had 44 software production firms, 24 of which belonged to the ministry of Informatics and Communications. The ministry has since reduced that number to 22. Most of the companies are devoted to supplying demand from Cuban institutions and the local economy, which is still heavily centralised. Young people are finding employment in firms like Desoft, which is dedicated to computerising business management and is present in the 15 provincial capitals and 139 municipalities, according to Anabel García, a spokeswoman for the state company. However, the average age of its employees is still around 40, she told IPS. But it was the young who were actually more in evidence at the fair. Among them was 27-year-old Abel Fírvida, who works on Nova, the Cuban adaptation of the Linux operating system, a free and open source software system created in 1990 by Linus Torvalds of Finland. Version 3.0 of Nova was presented at the fair. Owing to Fírvida’s excellent grades, he joined the project while he was still a student, and in his view, graduates with the best academic records do have good job opportunities. Nova was developed by UCI and a company created by the armed forces. At present it is available free to anyone interested in installing it, Fírvida, who is also a teacher, told IPS. The 60-member Nova team is thus contributing to migration to open-source digital systems that guarantee greater security and sovereignty. The case of Eliecer Avila is a good example: no work for him when he graduated.